In the two websites’ ongoing collaboration, BAMSRadio.com and IBleedCrimsonRed.com have the exclusive Q&A with yet another coach in position to take home some hardware. Late Sunday afternoon, the Alabama Frozen Tide hockey team defeated Florida 7-2, completing a three game sweep of the Southeastern College Hockey Conference Tournament and setting the stage for a run at the National Championship. Yes, you read that right—an Alabama hockey team is poised for a run at yet another national title. BAMSRadio’s BlipAngel caught up with head coach Mike Quenneville and queried him about the season and the national championship tournament ahead. Bama won the regular season SEC schedule and went into the conference tournament this weekend with a head full of steam. Has Bama ever won the conference tournament? This team has skated several different combinations for your lines. At one point you had one of your most experienced seniors, Mark Wysock, on a line with two Freshmen wingers who formed a very productive line for you. How has the combination of experienced upper classmen and talented under classmen combined for the Frozen Tide this season? Talk about the chemistry of the team, if you would. “Chemistry is everything and that’s one of the hardest things to do as a coach: put a lineup on the board that will work. We had some injuries early on and we had to do some juggling. Somehow we ended up with Mark Wysock centering freshmen Clay Link and Kenny Jannsen. The second line is sophomore and leading scorer Zach Dailey with newcomer Matt Mayes at center and freshman Cody Colbert on wing. The third line is sophomore Alex Dubrinsky with junior Brandon Butler at center and senior Sean Keeler on wing. The fourth and fifth line are all freshmen. It takes a few games to figure out what works and what doesn’t. We have a young team. “If you look at our player stats—we have many players with a lot of points—you don’t see this on many other teams. We try to mix it up so we can play four lines and hopefully have legs in the third period if we need to go with our ‘horses.’ On forward Sean Keeler and Wyscock are seniors and three defensemen are seniors: Christain Edge, Ryan Bartletta and Matthew Talton. “So I must say that the new players have really come on strong and made a impact for the team. We have a second string goaltender in John Bierchen ( 1st year goalie) that has come in and played 10 or so games and has pushed the starting goalie Sean Vinson to play up to his ability. “As you know we traveled early on to Michigan to play 4 games in 4 days then came home to a weekend off so the players could go watch a football game. The following weekend we went to South Florida to play 4 games in 4 days then the players on the next weekend off which was another home football game. “These trips were two fold: First, to become a good hockey team you must play the best. Two, Team Chemistry, Team bonding is a huge aspect of being successful. We used these trips to get to know one another. This is the first time Bama hockey has had a chance to compete for the national championship. One of the first questions non hockey fans ask when this gets discussed is "what are our chances?" “Our chances are one in 16. There will be four divisions of four teams that will play one game Wednesday, Thursday and Friday. Friday night, the team in each division that has the best record will move on to play in the semifinals on Saturday morning. In our division we have already played two of the three teams. Hope College out of Michigan beat us 7-1 but we just got off the bus from a 14 hour bus ride. They were also National Championship runners-up in 2010 and 2011. In Huntsville this year, we played Cal-State at Northridge and we beat them 5-4. The other team—California University of Pennsylvania is good too. They won the 2008 National Championship. It will be a very, very challenging tournament. “There are 140+ teams across the country and we are in the top 16 – we are really excited about going to nationals. Talk about the game that secured the team’s spot in the Nationals. Richmond is a team with a good reputation and a solid team all around team. You beat them 5-3 and never trailed. What were the highlights of that win at regionals? “We had to start fast and play a very disciplined game. We scored early and we were up 3-0 after the first period and I think we had a couple penalties. “I think the players in the second period got a little cocky and didn’t think Richmond could come back so they let there guard down a bit. After they made it 3-1, I called a timeout to get the players reeled back in to playing our game plan. Right after that we scored a powerplay goal to go up 4-1. Sean Vinson made some key saves for us going down the stretch, then we got in a penalty situation in the third. The team has a month to prepare for nationals. Will you do anything differently as you practice and condition for the tournament? “The tournament starts on Wednesday, March 14 In Vineland, New Jersey. We will probably leave Tuscaloosa on Monday morning. Monday night we will stop up in Virginia to practice and spend the night. Then on Tuesday we will get up, drive the remaining hours and hopefully practice on the ice where the tourney is being held. “We start play against California Wednesday. Be in a position to go to the Regional Tournament. We must be ranked in the top 10 out of fifty teams. Win two games at Regional’s so we can make history and play for a National Championship. Win the SECHC Conference Tournament. 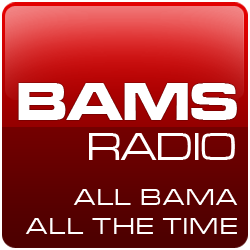 Visit BAMSradio.com and listen live each Wednesday night at 8:00 pm CST.